Make a stylish statement while staying productive with the 19" screen. The simple stand will add a modern look to your space. 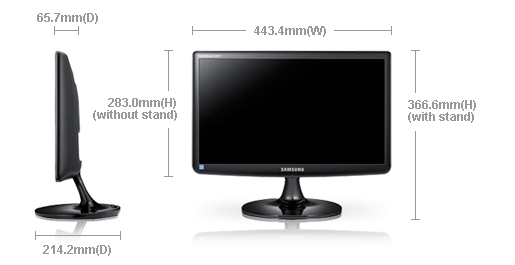 Samsung's SE450 Series provides an environmentally friendly, user friendly and budget friendly yet high quality desktop monitor solution for your business. The features of this 19" monitor include a simple and easy to use design, fully adjustable stand, matte black bezel with clearly labeled buttons, versatile connectivity and a low-glare commercial-grade TN panel. The sleek, stylish design and low profile stand take up less desk space and contribute to a cleaner-looking office. The built-in cable management feature also adds to a clutter-free work environment. Ergonomic, Adjustable Stand. The monitor swivels, tilts, pivots and is height-adjustable. And since it is VESA compatible, installation on a wall or separate mounting arms is easy. VGA and DVI provide flexibility in high-speed connectivity. So whatever devices your employees need to connect today or in the future, this monitor keeps everyone’s options open. Add stereo sound to your business monitor without taking up any additional desk space. The SPU10 speaker bar accessory features RMS output power of 2.5W and delivers full-range sound. So you can improve the quality of multimedia presentations, streaming videos or web-based seminars. Order the Samsung 22 inch Monitor today and have it delivered to your doorstep within 1-3 working days or same day delivery within Nairobi. Payment on delivery.